The crisp chill of fall is undeniable in Boston this week. We sleep with all of the windows in the house wide open, and this morning getting out of bed even gave me a few goosebumps! The anticipation of sweater weather has given the knit-a-longs I’m running for Caulfield and Trimmings a great energy. This morning, I thought I’d share some of our excitement. If you’re inspired too, join us on ravelry and play along! (Photo credit to indigodragonfly.) Didn’t she do an amazing job? You can find more details on her project page, but I’ll tell you right now that the yarn color is TARDIS, because I know you want to know. I’ve already worn my Caulfield several times, and am looking forward to using the tank as a vest, come fall. I know that Kim is still taking orders for custom yarn colors… …just in case you were interested in joining us. 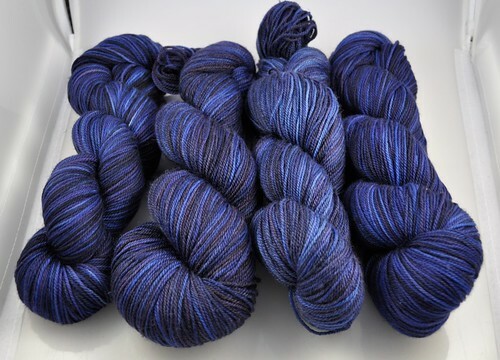 I think any of these would make a pretty amazing Rhinebeck sweater. Or here’s one more idea: Pick a commercial yarn for the MC, and use up some of your precious handspun for the stripes. In the mod-a-long post next week, I’ll step through of one of the most common mods: Matching two different sizes for your hips and your bust/shoulders. Happy knitting! I love the Tardis-colored sweater. Gorgeous!